TrustedInstaller is a built-in user in Windows 8 and earlier versions. TrustedInstaller owns a variety of system files, including the Windows folder, some Program Files folder and if it exists the Windows.old folder. The TrustedInstaller user account is used by the Windows Modules Installer which is part of Windows itself. The Windows Modules Installer handles installing, modifying and removing Windows components and updates. It’s the only user that can do this. 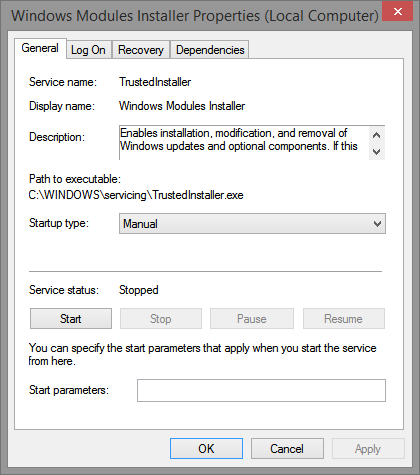 TrustedInstaller does normally not run, it’s a service that runs when it’s needed and when it’s done automatically disables itself. It does not start when Windows is booting. Can I disable the Account? Weirdly enough yes, however it strongly suggest you do not remove and/or disable the account, since this will cripple your system. Windows needs to have this user to be able to install, modifying and removing Windows components and updates. It’s the only user that can do this. This is normal, Windows is apparently updating or modifying some files. Let it just do it’s work. I have multiple TrustedInstaller services running, is it normal?